Beta-lactam antibiotics, including penicillin, are one of the most widely used classes of antibiotics in the world. Though they’ve been in use since the 1940s, scientists still don’t fully understand what happens when this class of drugs encounters bacteria. Now, researchers at the University of Notre Dame have elucidated how an enzyme helps bacteria rebound from damage inflicted by antibiotics not strong enough to immediately kill the bacteria on contact. The study, published in the Proceedings of the National Academy of Sciences, focuses on an enzyme in gram-negative bacterium Pseudomonas aeruginosa, a pathogen that causes pneumonia and sepsis. The enzyme, called lytic transglycosylase Slt, rapidly attempts repair of the organism’s cell wall, which allows the bacterium to survive and infection to proceed unabated. The cell walls of P. aeruginosa are made of long, adjacent units that are cross-linked together. In the presence of a beta-lactam antibiotic, the cross-links are not formed. However, long chains of uncross-linked polymers remain, which signal that the cell wall is damaged. That is where Slt comes in. The enzyme recognizes the damage and chops down the long chains of uncross-linked polymers, and the organism rebuilds the cell wall. “It’s sort of like if you’re driving home and get into a fender bender, and by the time you get home, your car is already repaired,” said Mobashery. Scientists have known about both families of enzymes for some time. Mobashery’s team synthesized pieces of the cell wall and studied it with Slt to determine how the enzyme degrades it. They sent purified Slt and cell wall samples to collaborators at the Spanish National Research Council to determine its structure. 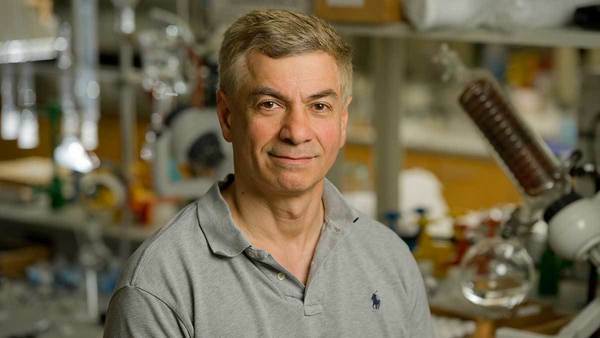 Mobashery has studied antibiotic resistance for 30 years and is affiliated with Notre Dame’s Advanced Diagnostics and Therapeutics and the Eck Institute for Global Health. He said penicillin-binding proteins have been studied since the 1960s and lytic transglycosylases since the 1990s — but the issue of how they come together is new. Because of antibiotic resistance, this bacterium has become one of the most difficult bacterial pathogens to treat. Co-authors of the study include Mijoon Lee, Shusuke Tomoshige, Kiran V. Mahasenan, David A. Dik, Dusan Hesek and Elena Lastochkin at Notre Dame, and Maria T. Batuecas, Teresa Dominguez-Gil, Claudia Millán, Isabel Usón and Juan A. Hermoso at the Spanish National Research Council. The National Institutes of Health and the Spanish Ministry of Economy and Competitiveness funded the study. Originally published by Jessica Sieff at news.nd.edu on April 09, 2018.